Is He being detained in China? 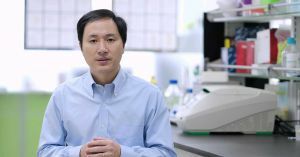 Just five days ago, it seemed like every pair of eyes in the world was fixed on He Jiankui, the researcher behind the controversial gene-editing of a pair of twin babies in China. On Wednesday, He took the stage at the Human Genome Editing Summit at the University of Hong Kong to present his research, the broad strokes of which had leaked to the press a few days prior. Significant backlash from the scientific community followed, and the Chinese government itself soon banned He from continuing his research. Now, no one seems to know where He is. Over the weekend, rumors circulated that the president of the Southern University of Science and Technology (SUSTC), He’s former employer, forced the scientist to return to Shenzhen, China, where the university was now detaining him. On Monday, the South China Morning Post (SCMP) published a statement from SUSTC that fell short of wholly refuting the rumor. Regardless of how that investigation plays out, though, He has pushed humanity across a line that it can never uncross. We now live in a world in which the first people with CRISPR-modified genes have been born. Will they be the first and last? Or simply the first?